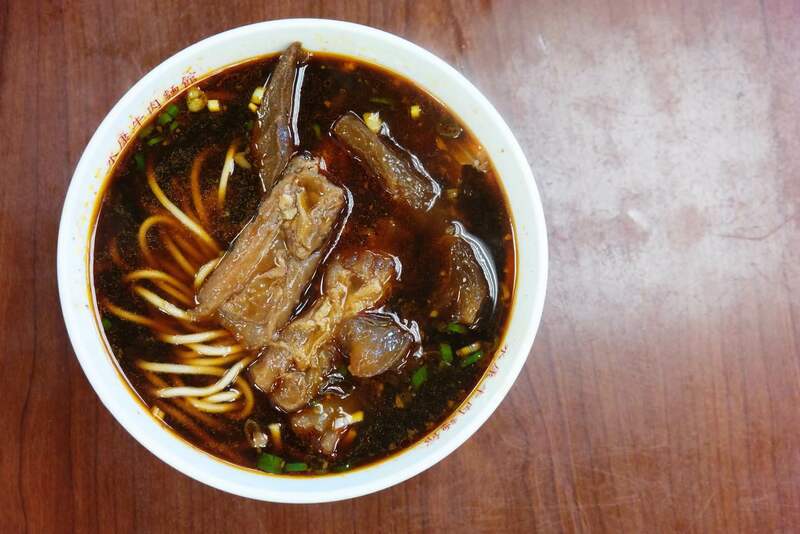 Boasting its own government-sanctioned annual festival, beef noodle soup is a national icon in Taiwan. Yet of the hundreds of restaurants in Taipei that serve this classic dish, which are truly the best? City543 teamed up with Roxanne Lo, Community Manager of Yelp Taipei, to find out. Over the course of two bloated lunches, we selected a who’s who of beef noodle soup – some perennial favorites and some lesser-known gems – and judged them based on taste. Where possible, we ordered a half meat-half tendon bowl; if condiments (pickled cabbage, chili oil) were offered separately, we sampled before and after adding them to the soup. 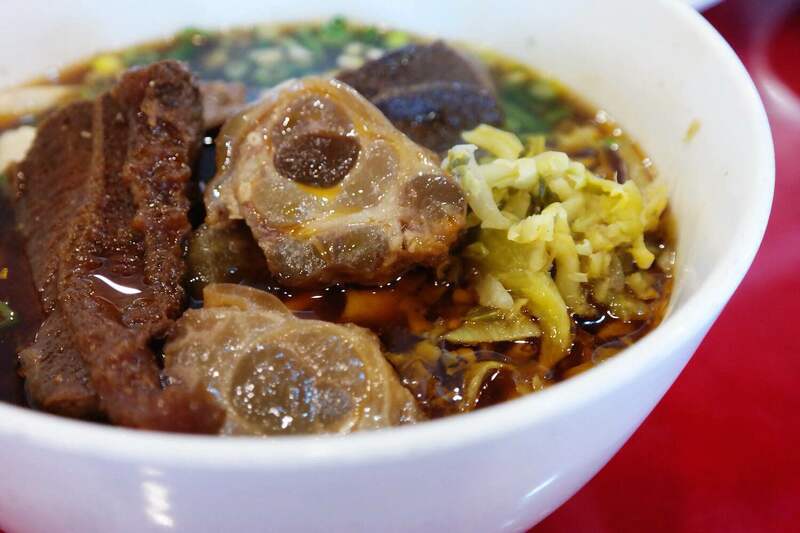 City543: If the massive horn sculpture that hangs off the wall is any indication, Niu Dian takes its cattle seriously: the ample slices of beef and succulent tendon that fill the bowls of beef noodle soup served here are certainly delicious. The broth is fragrant without being heavy, the udon-style noodles springy without being tough. Whereas some beef noodle places offer heavily seasoned chili oil on the side, this shop’s specialty bone marrow oil is milder, so feel free to add generously to the soup. Yelp: Roxanne considers this “a delicious bowl of noodles where each element worked with the others in harmony.” In particular, the beef is “the perfect tenderness” and the bone marrow oil is “flavorful without being overpowering.” Read her full review here. Insider tip: Niu Dian takes its spiciness more seriously than other establishments, so consider ordering one notch milder than your usual preference. 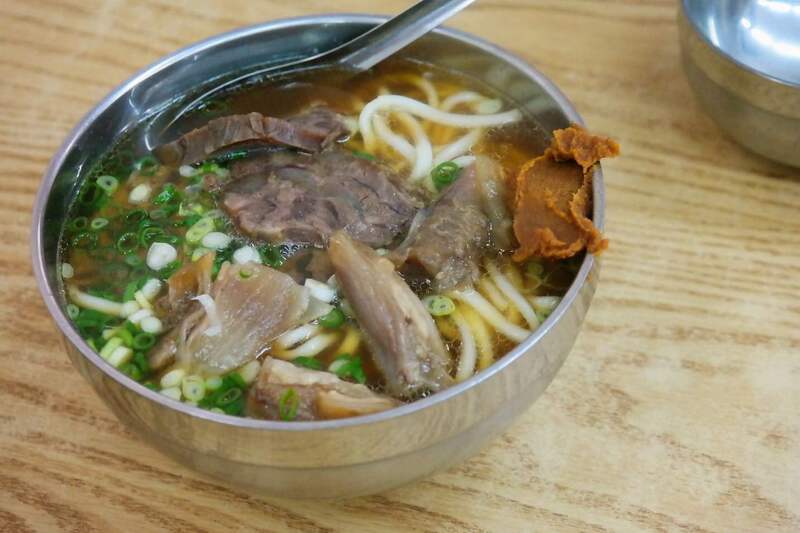 City543: This is beef noodle soup at its most traditional: chunks of meat and noodles in a bare-bones broth that tastes predominantly of soy sauce. The beef runs dry and the soup is salty, which means you’ll be reaching for water several times throughout the meal. It’s not a gourmet experience by any means, but if you’re looking for a filling meal, Lao Wang Ji certainly gets the job done. Yelp: Roxanne’s been a stalwart of this restaurant: “I’ve been coming to this place for as long as I can remember.” “The noodles are so good”; however, “the flavor is solely based on the soy sauce, so it gets rather salty and makes me leave half of the bowl untouched.” Read her full review here. Insider tip: If you’re lost, ask for directions to Taoyuan Street Beef Noodle (桃源街牛肉麵); most locals know Lao Wang Ji by its address. 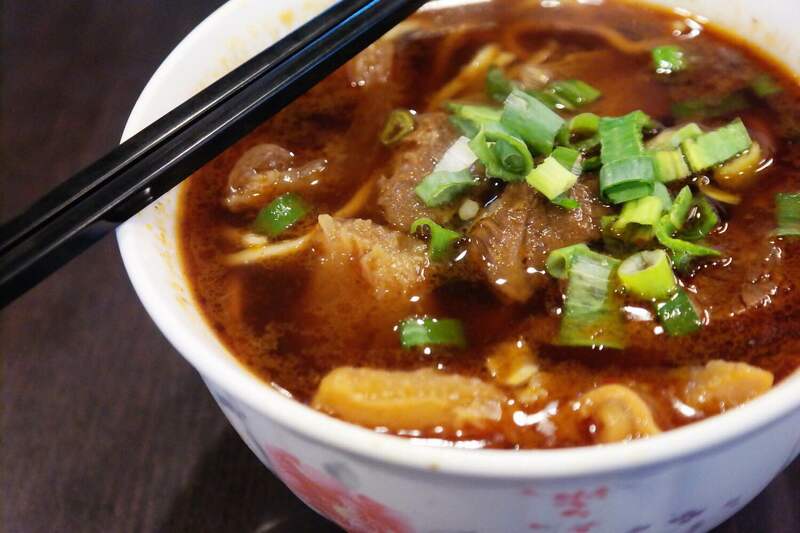 City543: Arguably the best known of the establishments on this list, Yong Kang Beef Noodle also suffers from having the most-imitated name; here, we’re talking about the classic restaurant that sits just two blocks from Dongmen Station. The beef noodle soup comes in a dark broth that is surprisingly balanced for its color; the large chunks of meat and tendon are tender. Disappointing, however, are the noodles: thin and tough at the core, they feel undercooked. Yelp: “The tendon and beef are flavorful but the noodles have a texture that reminds me of rubber bands that have been frozen and overstretched for a while. Not impressed.” Read Roxanne’s full review here. Insider tip: If you’re looking for dessert after your meal, don’t fall for the tourist-trap shaved ice monoliths that line the north end of Yongkang Street; satisfy your sweet tooth at one of the indie coffeeshops tucked away in the alleys. 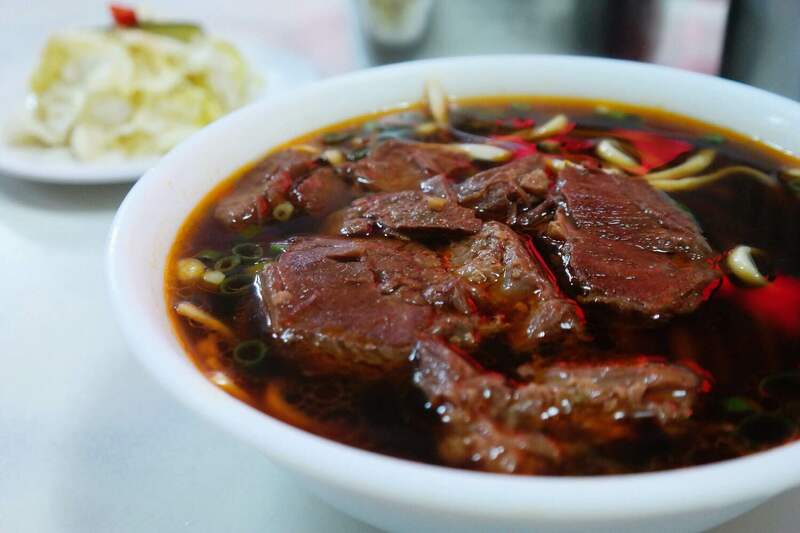 City543: We opted for the signature spicy broth the waitstaff recommended, but at Lao Zhang Beef Noodles, it’s really the beef that ought to star in the dish. The hefty chunks of tender meat are unfortunately overpowered by the soup base, which feels cloying after a few sips. The noodles are solid, if not particularly remarkable. Yelp: According to Roxanne, this is “a perfect balance of being flavorful without an overkill of MSG”; “the beef is marinated perfectly and noodles cooked al dente.” Read her full review here. Insider tip: Go for the clear broth instead; it sidesteps the heaviness of the spicy option and allows the natural flavors of the beef to shine. City543: The slices of beef at this old-school establishment stand out for the intensity of their meaty flavor. On the other hand, the broth can be somewhat bland, which is why Lin Dong Fang’s concentrated chili oil is a necessity: a little goes a long way in adding much-needed spice to the dish. The tendon, unfortunately, is tough; we’d go for the all-lean option next time. Yelp: “Not a huge fan of the noodle itself as it is rather tasteless flour to me and it’s way too overcooked for my liking. The only thing that is worth talking about is the tenderness of the beef and tendon.” Read Roxanne’s full review here. Insider tip: Part of Lin Dong Fang’s claim to fame is its late, late-night opening hours – we’re talking 5 a.m. – so if you regularly suffer from midnight hunger pangs, this is a must-visit. City543: Beef noodle soup at Zhen Shan Mei is unfortunately marred by a few flaws: pickled cabbage devoid of any flavor and a broth so oily that you can feel a film coat the roof of your mouth. The beef, though tender, is also dry. The thick noodles and soft tendon would stand fine on their own, but they can’t quite compensate for the other parts of the dish. 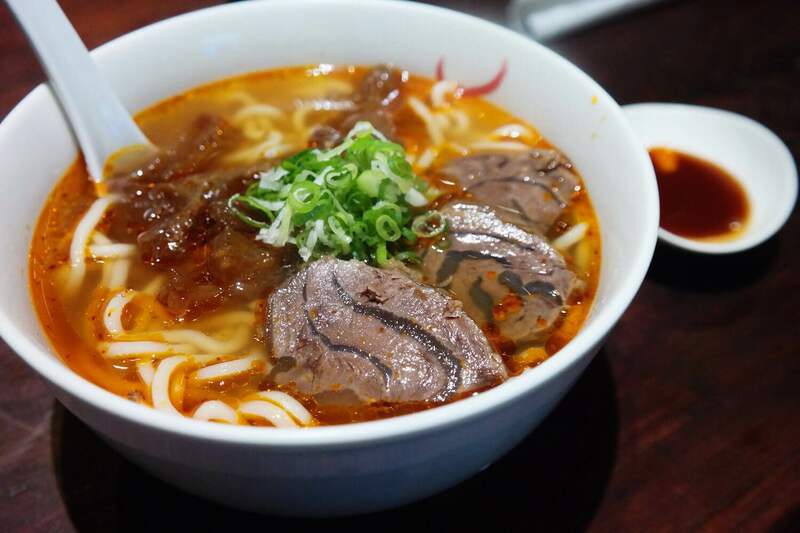 Yelp: While the “noodles and tendon are epic” and “absorbed the broth just perfectly,” “the beef is way too salty” and the soup is “too oily.” Regrettably, “their sauerkraut has no taste, so adding it does not help balance out the overall flavor.” Read Roxanne’s full review here. Insider tip: Surprisingly, the luwei (braised food) here is quite good. City543: With an extensive menu that highlights the provenance of its beef, Tian Xia San Jue positions itself as a restaurant for connoisseurs—and at 350NT for a half meat-half tendon bowl, you’re certainly paying for the bragging rights. A healthy sprinkling of scallions and your choice of thin or thick noodles (both well-textured) accompany tender beef and tendon, the latter with a remarkably pronounced star anise flavor. Sodium lovers should be aware that the broth is rather light; it’s clean and refined, but it may not offer the rich taste you’re looking for. Yelp: As the beef noodle soup was being served, “the smell of beef wafted over and commanded our attention.” Roxanne considers the broth “absolutely amazing” and the beef “instantly a favorite.” Read her full review here. Insider tip: The mirror-studded décor is a bit gauche, but if you’re looking for a beef noodle place to impress a date, this is one of your best bets. So how does this all stack up? After looking through our notes, we ranked our favorites. Beg to differ? 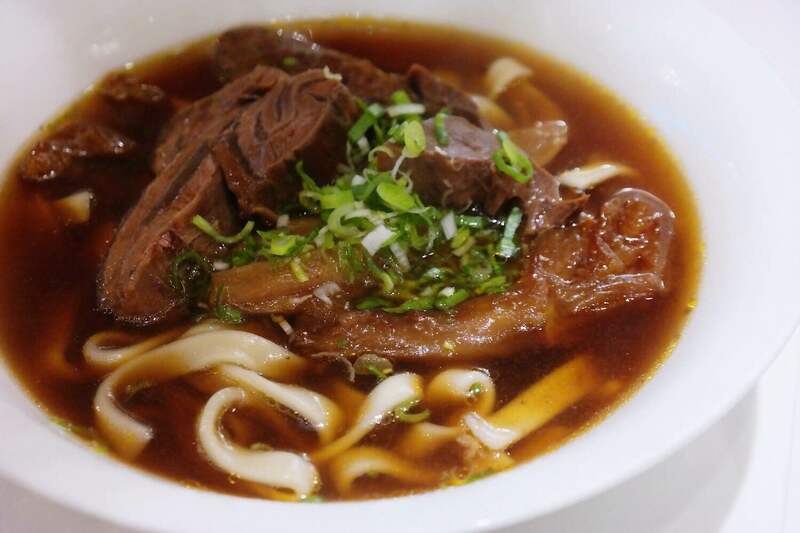 Let us know your favorite places to get beef noodle soup in the comments below! Article written in collaboration with Yelp. 熟成21 has really good beef! Kevin. You should try out 史記正宗牛肉麵 on Mingsheng E. Rd. Lao Wang Ji Beef Noodle (老王記牛肉麵) @ #15 Taoyuan St has always been my fav for more than 30 years.